Last year’s winner, Brian Creach. 96.1 KZEL also wants to give you a chance to win free passes to the Eugene Boat & Sportsmen’s Show, a guided fishing tour for two, and dinner at Dickey’s BBQ. Ocean fishing charter provided by Clarence Cole’s Fishin’ Trips Charters. All you have to do to win is click HERE and submit your best wildlife tattoo. Johnboy and C.y.D will pick a winner and announce it on the air February 1. Good luck! 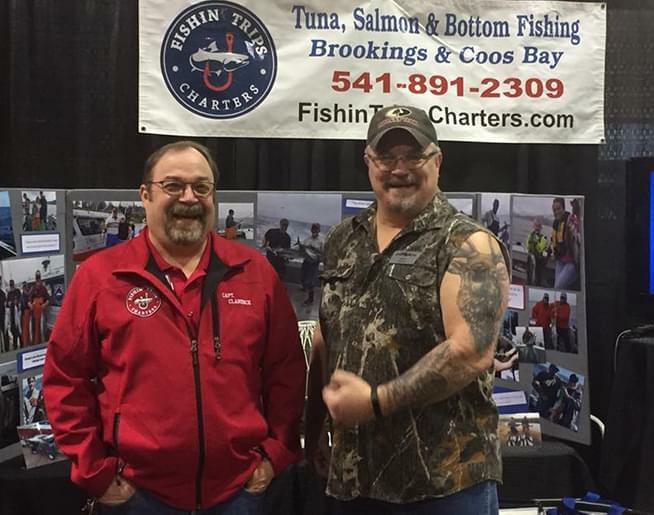 It’s time once again for the Eugene Boat & Sportsmen’s Show, sponsored by Bi-Mart and KEZI 9 News. This year’s show is going to be jam-packed with 100s of exhibits, displays and attractions representing the breadth of the outdoor recreation industry: boating, camping, fishing, hunting, RVing, ATVing, cycling, kayaking, paddling, hiking, biking, climbing, travel agents, tour guides, guns, cabin life, wildlife art, taxidermy, outdoor clothing and gear, advocacy groups and governmental agencies, seminars and fun for the whole family! Whew! Is that enough action and fun for ya!? Don’t miss out on this amazing event this year down at the Lane Events Center February 1-3. And if you haven’t heard yet, 96.1 KZEL is having a fairly significant anniversary this year. That’s right, we’re turning 50! And we’ve tied with the amazing, world champion Lumberjills to bring you one fo the absolute coolest prizes you can ever ask for if you’re a KZEL fan. The Lumberjills are making us a custom 50th anniversary wood carving. And the ONLY way you can win it is to go to the show and put your name in our entry box at the Lumberjills display area. You won’t want to miss out on this amazing opportunity for a truly one of a kind prize. And you also won’t want to miss out on what the Lumberjills have to offer. Axes will spin through the air, chain saws will slice through logs, chips will fly as steel bites into wood and logs will roll in a pool of water. These activities and actions will be part of the Timber Tina’s World Champion Lumberjills show. The Lumberjills will put on three shows a day involving all of these activities.The shows are high action, fast moving, educational, humorous, historical, and TONS of FUN! Find out more about the show by clicking HERE.